Your not lacking the right medication or super talented surgeon. You need someone who lives with your same pain and has found freedom! By no means am I a doctor or a licensed professional when it comes to diagnosing or treating back pain. All I know is what I have been through personally. Along the way I have been able to give people advice regarding their training when it comes to working through back pain with great results. The information I give on this site is just that, ADVICE. I don’t have the answers to all of your back pain but I do know where I can point you to start getting answers for yourself. I welcome anyone who is searching for solutions for themselves to suggestions or guidance but the most important thing is that your back pain is specific to you. Take everything I say with great consideration as whether or not it is something that would help or hurt you. If anything bring your questions and newly found information to your doctor and see what he says! Welcome! My name is William Richards and I am the founder of Fitness 4 Back Pain. I have been in the fitness industry for over 12 years learning everything there is to know about improving your life and being the strongest version of yourself. One of the biggest problems that I see today is the lack of education we have when it comes to solving our own pain problems. I was diagnosed with an L5-S1 rupture right out of high school and it has been my mission to stay as far away from the knife as I can. It crushed me being told so young that I had permanent damage to my body that would never fix its self. I was healthy, strong and did all the right things but as the years went on the pain increased. It had gotten to the point where the chiropractors, physical therapists and medications weren’t doing the trick. So I decided to make my own path towards my healing. You can’t fix everything but you sure has heck don’t have to spend the rest of your life on medication and suffering with chronic pain. I always knew that the damage to my disc was irreversible but that didn’t mean I had to live every day of my life in pain. I know what its like to wake up every day and the first thing on your mind is your back pain. Its all you can think about. You make a subconscious list of things you can’t do just because of your back pain. Well i’ll tell you what, I can stand before you to day and say that the chronic pain in my back has decreased over 90%. Now I have good days and bad days but I always know what I did to get a flare up. Over the years I have learned tons of techniques when it comes to mobility, what I eat, how I train and the lifestyle I lived. This isn’t about suggestions, these are real life tools that I have developed to alleviate some of the worst pains I have ever had. It was birthed from the understanding of what people with severe back pain deal with on a daily bases. This isn’t some medical center trying to sell you their high end medical treatment that consists of drugs, shots and surgery. These are real life solutions uncovered in the trenches of living through back pain day in and day out. Don’t get me wrong, I am not knocking the educated medical professionals. I received my Bachelors of Science at ODU studying Exercise Science as well as becoming certified by the American College of Sports Medicine. Education is important but its not everything. The professionals need to look outside of their textbooks and get into the shoes of their patients. You need someone who lives through your pain, who understands what it feels like to walk around with a cloudy mind simply because all you can think about is relieving the pain in your back. I pray that the information on this site will bring you the freedom you are looking for! Hello. I’m newly home from surprise surgery on March 1 or 2 I can’t remember. The last few days have been a blur. I was in an accident that resulted in a burst fracture of t11. And a fracture of t10 another fracture of t6. They decided to fuse T9,10,11,12 with rib bone and rods and wire and 6 screws. Putting a wire between 10/11 forming a h out of the medal. My question is can you point me in the direction to what articles I should read? As most of what I have read is about the lower lumbar. I’m looking at as much as I can because god gave me one body. And it’s been beaten up. I need to change how I do things and the do’s and don’ts of my new life and body. I know I have a very long recover and I need to take it slow. I know this because my body told me so. After spending a life time stressing about proper body mechanics I find myself faced with new learning. And this seemed like a good place to start. I also want to make sure my pt and ot help know what they are doing. Sometimes best intentions are the worse advice. I don’t know if the direction I’ll be getting is correct. I am a 52-yo female in excellent shape for the most part. I was in a bad car accident in June 2018 and my L-1 was shattered. I am 6 months PO from a multilevel spinal fusion (T-12 to L2 with 2 rods and 9 screws). I am grateful to be alive and not paralyzed, nor was anyone else injured. I never had any back issues prior to the accident, but I feel like I am in the club, now. I don’t have a huge amount of back pain at this point. But some, and mainly the pain is neuropathic. It is improving, but slowly. My neurosurgeon has granted me permission to workout as long as I use primarily my body weight, and to pay attention to my body as I ease back into it. I was an avid runner for over 35 years, but I am advised to wait at least 12 months before returning to running. However, my husband and I were active cyclists prior to the accident, and I am allowed to cycle, but slow to start. I really appreciate the hard work and dedication you have put into your website. It is very informative, and I ran across it purely by accident while searching for safe exercises to do at the gym. I was wondering if you could make some recommendations in terms of what I can do at the gym after I warm up by walking on the treadmill or the bike for a bit? Is TRX a safe activity for someone who has had a spinal fusion? I have done a few light things using the TRX straps, and it feels good, but I wanted to ask someone else who has the experience in working out after a spinal fusion. If so, can you recommend a link where I can print out the different exercises? I really appreciate your time, sir. Thanks! I am 71, though I’ve never been a regular at exercise and do a lot of sitting at the computer for work, I have done a fair amount of walking and other activities which have kept me reasonably fit. I had a level 3, S1-T10 fusion with T9 cemented on 3/5/18. Prior to my surgery I was not sleeping much, having a great deal of pain, walking was especially painful in my right leg. I have had scoliosis all my life as far as I know. Last year I found out I had one vertebrae sliding out of my spine and according to the doctor 3 mil from severing the nerves in my spinal column. I also found out I have bone on bone in my right knee and arthritis in my knees and right hand. I had 3 euflexxa injections in 7/2018 in my right knee that seem to be helping, though arthritis is still causing pain around my knee. I was really out of it in the hospital, then rehab for 2 weeks. I was in so much pain I didn’t get through much in rehab. For 2 months I was in terrible pain; extreme vomiting escalated over those 2 months. The vomiting was very violent and also apparently caused acid reflux. All of this was drug interaction problems (Morphine, Oxicodone, Gababpentin and Tazidine (I’m not sure about the spellings ;-)). When they finally took me off the muscle relaxant, the vomiting stopped and my pain went from 8-9 to 3-4 in 48 hrs. The vomiting and acid reflux apparently set me up for pneumonia and my lungs were scared in the process (I will see my lung doctor in Oct. to see if it is healing). I was in the hospital 3 more times after my spinal fusion, the last time being Memorial Day week-end. I have weaned myself off all pain medications the last, Gabapentin, I ended the 2nd week in July. I do still take Excedrin or Tylenol for pain. CBD oil has helped some too. I have been making steady though very slow progress. I went from excruciating pain in my right leg to after the surgery the pain was in my left leg and I had to, in a way, learn to walk again. Unlike some of your others writers, my pain wasn’t over with the surgery. It has been getting better and I see steady though very slow improvements. My left leg is now mostly pain free, I’m still having pain in my back and down my right leg. I have been trying to walk more and do some simple stretches. Some of the hardest part right now is that I still have so little energy. I also seem to be dealing with some brain fog even though I’m not on “drugs”. When I have been vertical for about 3 hours there is a deep aching pain in my lower back and I feel like someone pulled a plug that immediately drains all of my energy. Even now, nearing the end of 6 months since my surgery, I am still spending more time in bed than out. I’m fighting depression and finding it difficult to get myself motivated. I’m glad I found your website and will begin putting what you’ve taught to work. If you have any insights to help me move through this depression, brain fog and regain my energy, I would appreciate it. I was also looking at your Core Essentials Course. I am not supposed to bend or twist ever again. If I purchase your course are there lessons I should avoid? Just watched some of your videos and want to let you know that I think you are very gifted at teaching. And teaching expertly is not possible without expertise – and yours is obvious. I am a post rehab specialist (since 93, AAHFRP/Michael Jones group) and I appreciate others like you who are “out there” providing evidence-based guidelines and personal advice in such a helpful, effective, even free(!) manner. I am about to have spinal fusion in two days for L4/L5 with a laminectomy and removal of a large synovial cyst in the nerve canal. I DREAD it. It was soooo helpful to to see YOU, also an athlete, be so fit and capable while also dealing with serious back issues. So thanks for the ray of sunshine today. You made my day! Thank you so much for the kind words! what I try to teach is hard to fit into the “medical system” it just takes to long to teach and walk people through. I am blessed to no have to worry about “keeping my doors open” which allows me to just teach from my own experience and what I have learned on my own journey. Thank you! Ive been following you on Instagram for a while and love your information. I’m a 31 year old Mom with two kids (2 and 4) and am having a l4-l5 microdiscectomy in 2 weeks. I’ve had bad sciatic pain in both legs for almost 2 years and am just ready for it to be over. I miss being the athlete I used to be! Is your program helpful for post surgery activities? I used to run, do HIIT, lift weights, etc. and just cannot wait to be more active again. Thanks for your support! Yes, once you have been cleared by your physician to get back into normal activities, come talk to me. They will more than likely put you through some sort of 4-6 week therapy post surgery. Shoot me an email [email protected]. I would love to keep up with your procedure and recovery. Keep me in the loop! This site is incredibly informative. I especially like the instructional video on QL self massage. Let me briefly tell you about my situation. About a month ago I was doing some daily body stretches when I began standing side bends. For some reason I didn’t keep my spine and legs aligned. Instead, my upper body was slightly forward. I believe the reason I did this was that it felt as though my stretch was further/deeper, and I assumed that meant it was more effective. It didn’t take long to realize how wrong I was. Within seconds I felt pain in both of my sides; a pain I had never felt before. For the next couple of weeks I was limited in my mobility and spent most of my time resting. I took anti-inflammatories, iced the areas and restricted most physical demands. The pain slowly began to fade. I can now put my socks and shoes on with little discomfort. I still feel some pain, especially when I sit down in a chair or get behind the wheel of a car, but overall it has greatly improved. Would you suggest I use hot/cold techniques? I tried some of the self massaging and that really seems to ease some of the pain. I appreciate your time and help! Thanks so much for your comment! It sounds like you are on to something with your strategy. In times of flare ups that seem to bring on tightness and what seems to be muscles that need to be stretched, I find it better to just focus on breathing techniques daily walks and ice and heat where applicable. For some people, it’s the stretching that stuff that makes things worse and even tighter. I found your website this morning and am going to try your stretches. Fingers crossed! I do have a question, though. My back pain is upper – mostly between the shoulder blades and sometimes right down the middle (either side of my spine) or around to my ribs. I have been having this for 2 years now – ended up in the ER twice. A CAT scan showed nothing. I have been told by physical therapists that it is due to forward head posture and I would have to agree, but I didn’t get much relief from physical therapy. I have had a desk job for many years and a couple of stressful years lately where I could feel my shoulders creeping up to my ears. My question is – I notice that in your article you mention lower back pain from posture issues. Would they also cause the type of pain I am describing? Do you think your program is helpful for upper back pain as well? Hey Mary! I am glad you found the site! To answer your question, Yes, absolutely addressing these long term habits will affect your upper/midback pain. It makes sense why PT didn’t bring you a lot of results. Thats whats wrong with the medical industry. You may have been on the right track in PT but it’s not realistic to continuously go for the amount of time its going to take to reverse what has been done over all this time. Think of the content you read on this site whether stretching, tissue release or exercises as something you need to adopt and continue to do forever. These are lifestyle habits that need to be created and in return your body will respond in a positive way. Hi! I found your site through a search and I am super intrigued! I signed up to receive the emails and one recently listed a link for a video collection for 14 weeks called Core essentials. Now I see there is a book available as well. Which do you recommend starting with or do they have the same information in them? I have two self study courses one is Breaking The Pain Cycle. This course teach you how to identify, stop and reverse the specific areas of your daily life that are causing a level of pain that even exercise can’t fix. Once working through that there is a second course called Core Essentials. 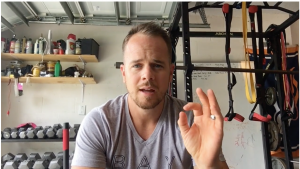 This teaches you to build off of that foundation you have from Breaking the Pain Cycle with a primary focus on core training from a rebuilding stand point. it teaches you proper core engagement and Coordination in order to stabilize your spine and rebuild strength after a surgery. Core Essentials starts from the ground up from pelvic floor control, “Core Locking” to more advanced “modern” training. I like you ruptured my L5 S1 18 months ago and elected not to have surgery. Prior to that I had 4 years of chronic and progressive pain as I was being super fit with competitive recreational tennis (junior college level even though I was mid 40’s). Prior to that I had had a sciatic at the age of 32 with a herniation that pressed on my right S1 nerve due to car rear-end. Now I can put it all together that I was on a path and could have taken more care of myself with better posture, more balanced exercise vs just tennis all the time. I’ve tried to return to my passionate sport of tennis but it is still a pain trigger and I’ve accepted now not worth it right now. I’ve made progress but anything in the gym can set me back to another ESI or weeks of rest in bed. Sometimes I fixate on an MRI image and want surgery (microdiscectomy) but other times it seems like it may be SI joint or purely muscular due to response with muscle relaxants. The back tricks my mind. It’s tough but I’ve studied everyone on the Internet and seen every type of medical professional available. I came up with a program similar to yours. You are on the right track and doing good with these videos. Only a couple of sources that are logical like this. The medical profession is not well suited to have the patience they need to help people get better. We need to each educate ourselves and be our own doctors. I couldn’t have said it any better myself. I say keep plugging away and use trial and error to guide your steps. Any way I can help think through something let me know. I am just like anyone else. I struggled to find relief even being in the profession that I am in. I ignored the truth and got lazy. It wasn’t until I started to dig in and trust what I was doing that I started to see relief! Hi William, I will start walking the way you recommended to release my QL pain. This pain is like you loaded a heavy weight in your shoulders, a pressing by my kidneys and latinus dorsi. Never been in so much pain in my entire life! I’m very athletic via yoga and hiking daily. Chiropractor said ql muscle is in such spasm that it’s affecting the nerves in my left leg.I am icing and heating xmd rest. Acupuncture tomorrow.Will try mashing it out with a lacrosse ball too. Sometimes your QL can be fired up from poor posture and over use. This is just my opinion but have you tried stepping away from yoga and hiking and sticking strictly to short, moderate pace, flat land walks? On top of that really focusing in our posture and movement mechanics when sitting standing and bending. My QL used to be on fire all the time and until I made it a daily habit to focus less on “exercise” and more on correcting the posture and movement basics it allowed my body to stop ver working and finally allow the muscles to release. Sometimes smashing a muscle that is over stimulated can just cause more stiffness and discomfort. My entire lower back was like that and still is from time to time. When it gets tight from too much flexion I spend more time on my posture and healthy positions then I do trying to smash out the muscles. Thanks for stopping by! I hope your recovery is fast and pain free! Yes, it is OUR responsibility to keep our backs happy and healthy. You will make decisions every day from here on out that will either help or hurt the long term results of both that procedure and your recovery. Go slow and be mindful of your body position and how you move. Hinge and the waist and keep that spine off the pain cycle! At the same time, your back IS NOT fragile. It is strong and just because you had this done doesn’t mean anything about how weak you are or need to feel. Listen to your body. You will come out on top! Keep me updated and be sure to connect with us here on the site!